“Going Green” is the “in” thing and manufacturers of cleaning products have joined the bandwagon, filling supermarket shelves with “earth friendly” cleaners. But not all the products which claim that they contain “natural” ingredients are eco-friendly and in many cases, the process of producing these products or packaging them may cause damage to the environment. 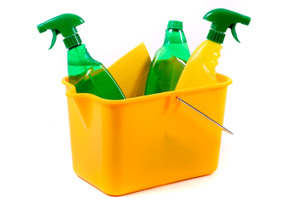 Avoid household cleaners with words like “warning” “danger” ”caution” “poison” or “corrosive” on the label. If they can harm humans, they can harm the environment and we don’t want them to end up in the waste water stream or in land fills. If you have a stash of these in your cleaning closet or under the sink, check with your recycling center about disposing hazardous waste. Ensure that you use mops, sponges, rags and other cleaning accessories that are reusable and made from natural material. Avoid using paper towels, use rags and old clothes instead. If buying paper towels, go for unbleached towels made from recycled paper. Chuck the chlorine bleach or phenol when you want to disinfect the bathroom or clean the kitchen sink. Use vinegar and soda bicarbonate and disinfectants made with essentials oils like lavender or eucalyptus. Plants and sprays made with essentials oils can make the air indoors fresh and reduce air pollution indoors, without the need for room fresheners. Micro-fiber cloth used to clean dusty surfaces is safer and does not need cleaning liquids or detergent. Ensure that when you buy eco-friendly cleaning products off the shelf that they are packaged in recyclable material. Buy larger packs that use lesser packaging materials instead of several small packs. Bio-degradable laundry detergents and fabric softeners ensure that you don’t let a cocktail of chemicals and bleaches into the waste water stream. Heavy duty all purpose cleaners for bathroom tiles and organic degreasers for countertops in the kitchen are also available free of harmful chemicals. Be kind to the environment and use local products rather than those that leave a large carbon footprint, transported over thousands of miles. When you buy a cleaning product for your home, read the label carefully and look for a seal like the DfE seal or the Green Seal. In the absence of either of these two on a product, read the list of ingredients and find out what goes into the making of the product and then decide if you want to use it at home or not.